N.B. This manual is a part of the manual: "How to see Chakras with your own eyes, and not only "feel" them. Practical manual to learn, fast, how to see them, and how to open the Third Eye"
From now on, you can too! - Practical essoteric manuals: Chakra meditation, test, healing, colors, balancing, opening, activation, awakening, cleansing, seeing and so on... in a few minutes! 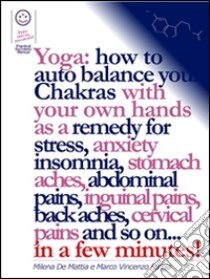 Title: "Yoga: how to auto balance your Chakras with your own hands." As a remedy for stress, anxiety insomnia, stomach aches, abdominal pains, inguinal pains, back aches, cervical pains and so on... in few minutes! I’ve always been fascinated by energy, frequencies, resonances and by the idea that special vibes are originated by everything that exists. Then, in 2012, I met Marco. I was intrigued by what he wrote about ‘magic disks’ and about the energy arising from a person’s hands, which anyone can use. Although we couldn’t agree on almost anything (or maybe because of it…? ), we confronted our personal life experiences (his were much more earthy than mine…) and found out that Chakras can actually be seen!